List all the ingredients in this salad and WIN! Winner gets one (1) FREE jar of Cajun Chef Ryan’s Spice Mix, with your choice of either the “Cajun Spice Blend” or “Finger Lickin’ Rub” with Free Shipping too! To enter the contest you must have a registered account with Cajun Chef Ryan (CCR). Your Cajun Chef Ryan online account must include a valid email address, screen name, and real name. Only one entry is allowed per registered CCR account. To submit your contest entry please post your salad ingredient list in a comment on this blog post or send an email to cajunchefryan@rymocs.com. If posting your entry by email be sure to include your CCR screen name, real name and use your valid email address that is registered on your CCR account. Comments from Food Buzz friends and members are always welcome, but to be considered a valid entry for this contest you must register online with Cajun Chef Ryan to submit an entry. In the case of a tie or where multiple entries are submitted with all or the most correct salad ingredients then each entrants name will be written on a sheet of paper for a drawing and one (1) winner will be selected. Deadline for entry is 23:59:59 Eastern Daylight Time (EDT) on Monday, September 22, 2008. The winner will be selected on Tuesday, September 23, 2008 and will be notified by email within one business day. 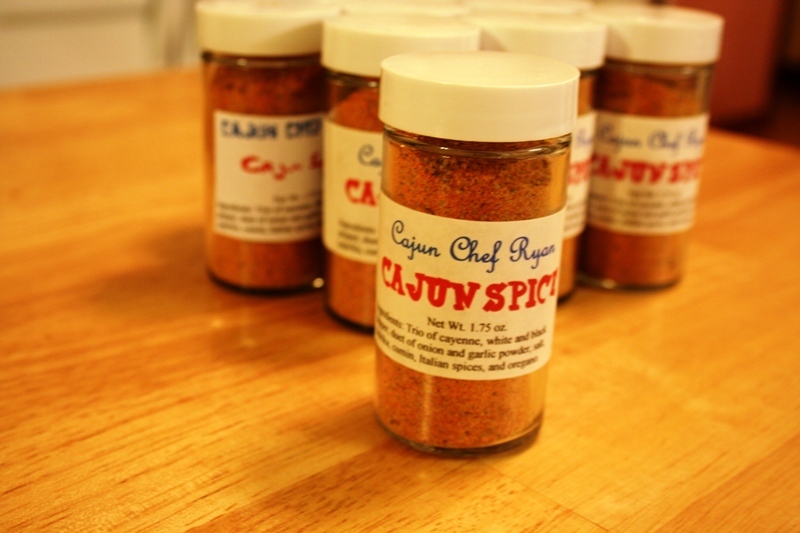 To qualify for and receive the winning one (1) jar of Cajun Chef Ryan spice mix you must have a valid mailing address. The one (1) jar of Cajun Chef Ryan winning spice mix will be mailed via USPS Priority Mail upon confirmation of the winning entry and a valid mailing address. All arranged over a generous sprinkling of your Cajun Chef Ryan’s Cajun Spice. We have a winner! And it was a very close match, but Dave wins the jar of Cajun Chef Ryan spice mix of his choice with the most correct items listed for the salad contest. Anne will also get a consolation prize which is a PDF file copy of our popular dessert recipe for Key Lime Pie. Don’t keep us in suspense, Ryan! What are the ingredients? Dave, you listed all the ingredients, but got half credit for the lettuce since it was romaine and not leaf lettuce or spinach. Anne missed the pumpkin seeds. A lovely salad with a lovely contest with a lovely winner with a lovely(ok ok rocking…) prize…. Let me know when your next contest is and I will get a head start to guess the things in the dish or on the plate! I will buy it regardless, no matter what! Excellent food. Friendly people. I recommend this place to anyone who loves great food New Orleans Bar and Grill.